• Location: River Mile 315.8. 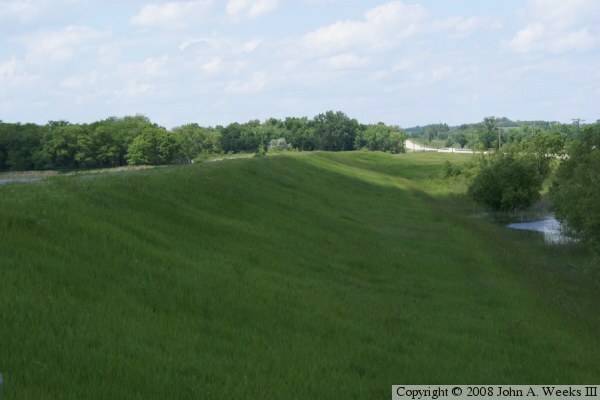 • Structure Type: Earthen Embankment. • Structure Width: 16,250 Feet, Single 65 Foot Leaf Gate. • River Elevation (Pool): 956 Feet. • River Elevation (Outflow): 940 Feet. • Water Fall: 16 Feet. 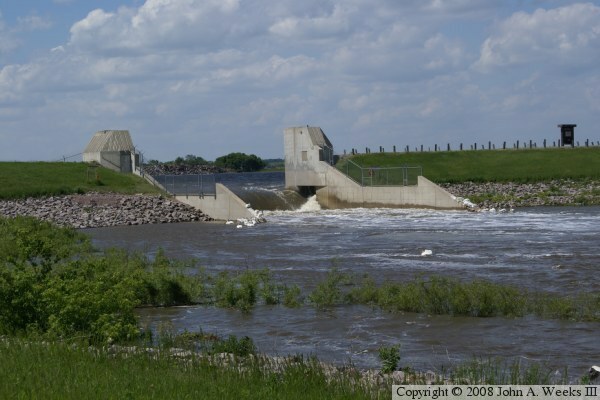 The Highway 75 Dam is a relatively new structure compared with other dams on the Minnesota River. 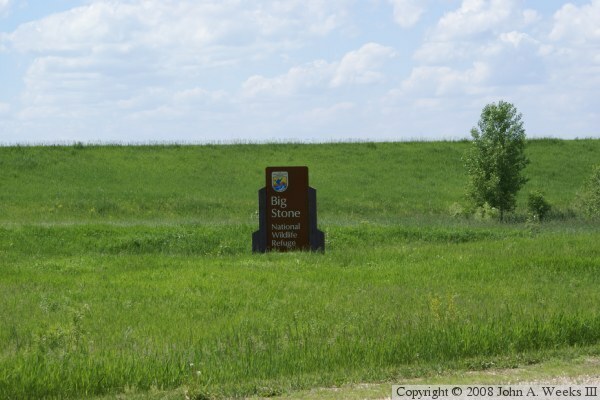 It was built as part of the creation of the Big Stone National Wildlife Refuge, which extends west of the dam nearly to the state line. The refuge was authorized in 1971. Work began right away to purchase land and start building the dam. The dam was operational in 1972, and competed by 1975. At that time, the US Army Corps of Engineers, which built the dam, turned over control of the refuge to the US Fish and Wildlife Service. 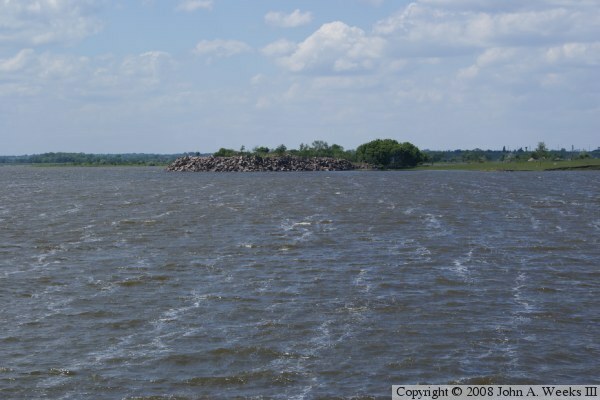 The dam features a 3 mile long earthen embankment. A single 65 foot wide bascule leaf gate is capable of raising the pool 23 feet, but during normal operation, the pool is maintained at the 956 foot elevation resulting in a 16 foot water fall. 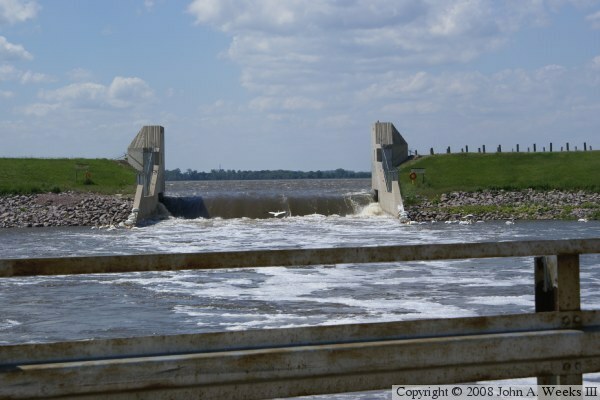 The dam is named after highway US-75, which runs parallel to the dam. The water flow in this area is complex. 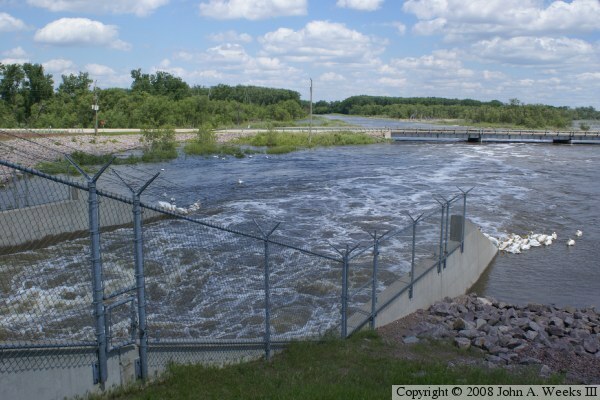 The Minnesota River channel enters the dam pool from the northwest. The river exists the dam though a tunnel that is controlled by a valve near the north end of the dam. The river channel then flows to the east, crosses under US-75, turns south, and crosses under Township Road 159. The river channel then flows south until it is across the highway from the dam gate structure. The Yellow River flows into the main pool area behind the dam, and the gate structure is located in the Yellow River Channel. Water flowing out the gate flows down the Yellow River channel to meet the Minnesota River. 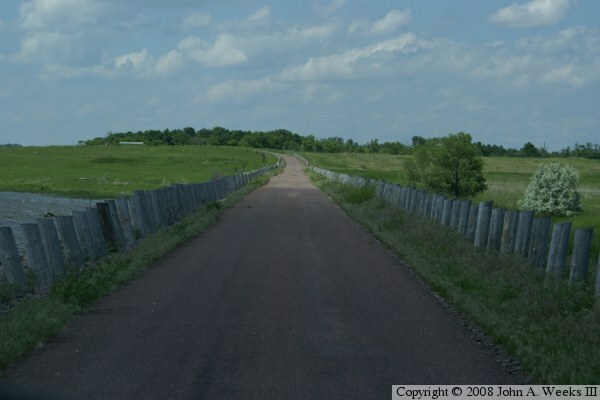 The photo above shows the dam embankment at the south end of the dam as one enters the Big Stone National Wildlife Refuge on US-75. 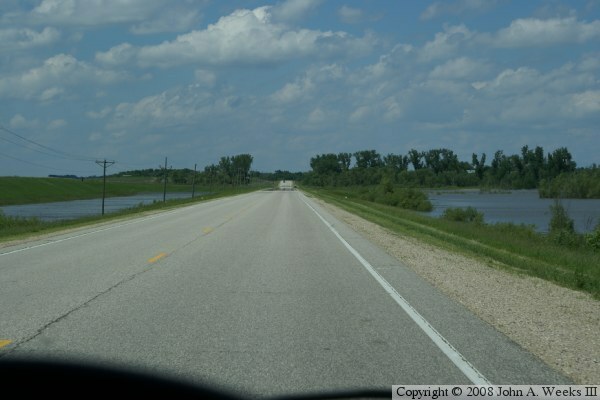 The photo below is looking northbound on US-75 as it crosses the marshy area south of the outflow channel. 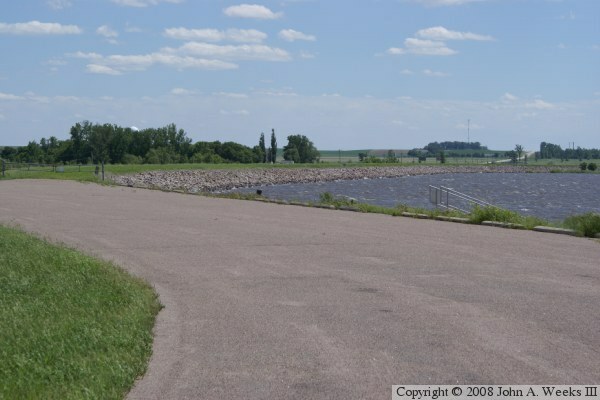 The photo above is looking south along the rim of the dam. US-75 is just beyond the rim, and can be seen in the background towards the right side of the photo. The photo below is looking north from the main gate visitor parking lot. The dam's 65 foot wide gate is located in this concrete structure. The photo above shows the water exiting the gate and flowing down the Yellow River channel. The bridge carries US-75 over the outflow channel. The bridge was in place 16 years before the dam was built, so it was built for lower water levels and lower water flow rates. 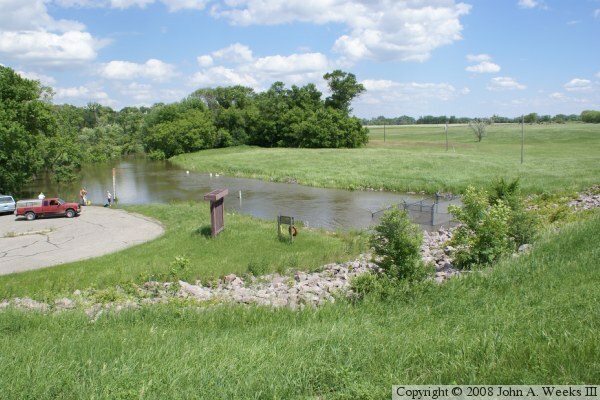 The outflow channel joins the Minnesota River just beyond the treeline in the distance. The photo below shows the US-75 bridge from a slightly different angle. The photo below shows the water flowing over the dam gate. 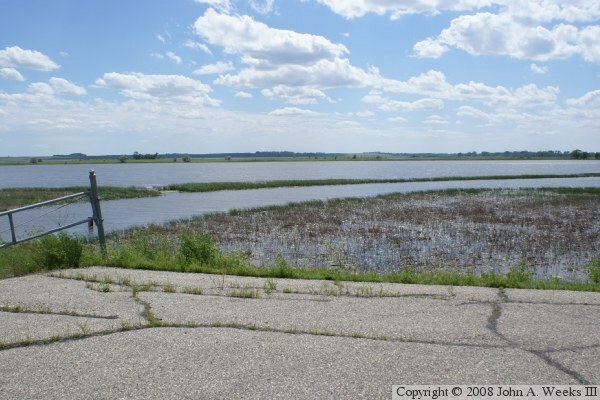 The Midwest was subject to an unusual period of rainfall in 2008, resulting in the high water flow rate that we see here. The photo below shows a close up view of the water rushing through the gate. The photo above is a view of the dam gate structure taken from the US-75 bridge. The water in the outflow channel is very high, which makes the waterfall coming out of the dam appear to be shorter. The normal water fall is about 16 feet, but since the channel is about 6 feet above normal, the water is only dropping about 10 feet. The photo below is a view of the dam looking north. A one way road is open to the public and runs about one half of a mile along the top of the dam embankment. The photo above is looking west from the dam road. The feature of interest is the large pile of rocks. 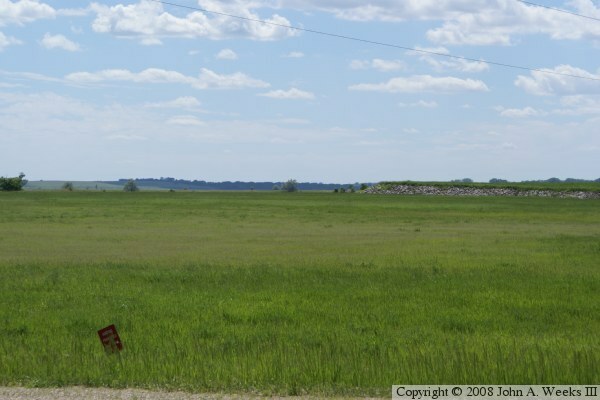 When the glacial lake Agassiz drained and cut the river valley through this section 8,000 years ago, it deposited large quantities of gravel and rock debris that had been ground but the glaciers as they moved south during the ice age. The photo below is a view of the dam looking north after cresting a small hill. The photo above is a few of the downriver face of the dam. US-75 is visible on the right side of the photo. 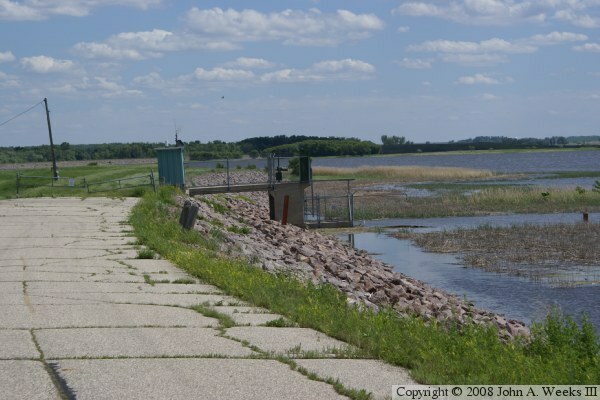 The photo below shows an area of the dam that is cut out and is slightly lower than the rest of the dam. 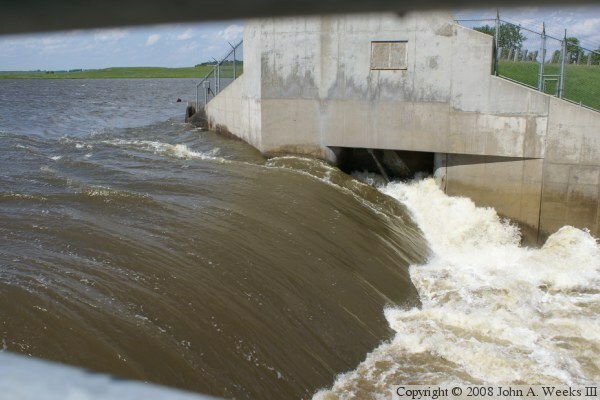 This is an emergency overflow channel that will let the water overtop this section of the dam during an emergency to attempt to continue to maintain control of the water flow and to prevent failure of the dam in extreme floods. 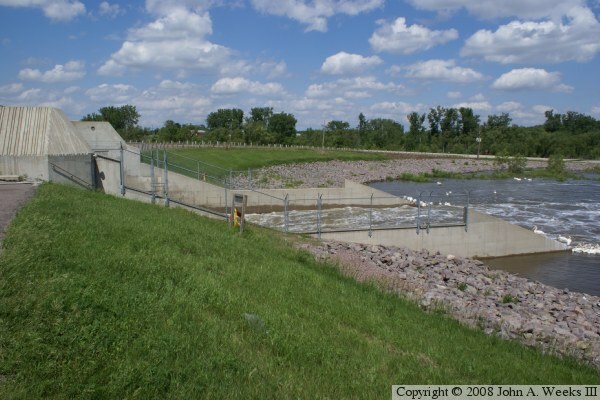 The photo above shows the main Minnesota River channel discharge intake valve. The photo below shows the old main river channel still being visible despite the higher waters behind the dam. 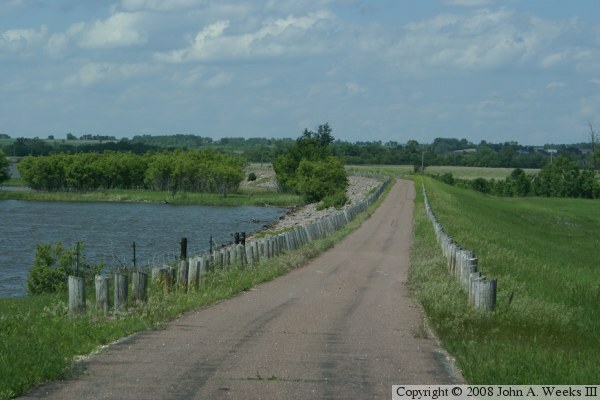 This area of the dam is open to vehicles, and is available by taking a side road off of US-75, then locating the dam entrance road off of the side road. 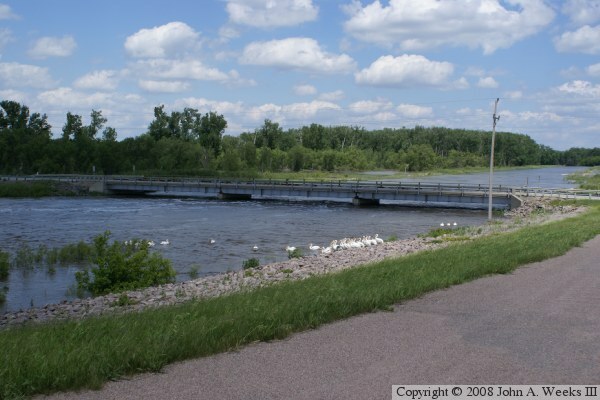 The photo above shows the main Minnesota River channel. The water flows into an intake on the west side of the dam, then flows through a tunnel to the east side of the dam. The water exits the tunnel and flows down the river channel. 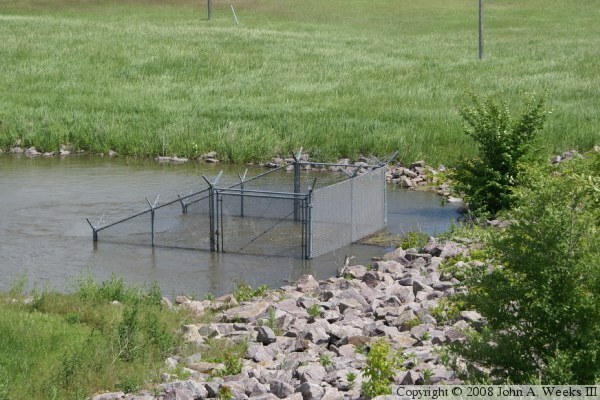 The photo below is a close-up view of the fence around the water discharge pipe. The water is about 3 feet higher than normal at this location.